Planning an itinerary is not easy. Often, you have to consider geographical distance, topological connectivity, and temporal factors at the same time. 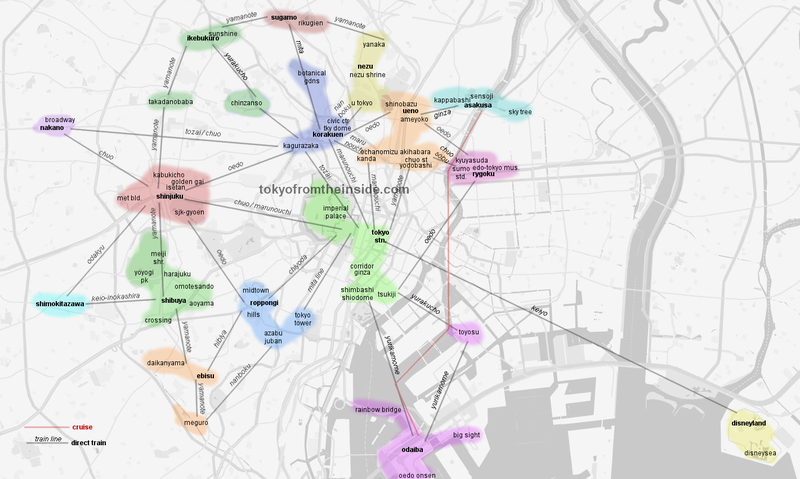 Add to that the complexity of a super dense Tokyo with over 500 train stations in its central region alone, and you have a bit of a nightmare. In an attempt to make sense of things, we have created a map with zones of attractions. The zones represent groups of attractions you should consider planning to visit on the same day. The map also shows the direct train routes between the zones. In this article, you will also find summarized information of the main attractions in each zone. Chinzanso night May – June fireflies! Meiji Shrine 0500 – 1800 all year shrine, traditional weddings! Traditional wedding observable by members of the public at Meiji Shrine. View from the Tokyo Tower at sunset. All shades of autumn at the Koishikawa Korakuen.